Michael & Son is back this weekend with another episode of Helping Hands. This week, we meet a family in the making and a couple whose strong bond of over 40 years carried them through an unimaginable tragedy. On a rainy night in Madonna Maryland, Delano Draine was making his way home to his wife. Delano was full of optimism; he was 6 days from retirement and ready for some long overdue relaxation. A hard working man since a young age, Delano spent years in the military and then settled into a job as a corrections officer. The hours were long, the work was dangerous and the stress was tolling; Delano was glad to be done with it. As Delano weaved down the wet and winding road he had no idea his life was about to change forever. Out of nowhere, a deer appeared in the middle of the road, Delano swerved to avoid it and everything went black. When Delano opened his eyes he was upside down inside is car. He felt a tremendous amount of pain but was still able to fish his phone out of his pocket. His first call was to 9-11 and the second was the hardest call he’s ever had to make. Forty minutes away from where Delano lay suspended in his car, Shelley, his wife, was preparing a late dinner for two. Around 9:15 pm, Shelley received a phone call that left her pale and trembling. The voice on the other end was her husband, he was badly hurt and being rushed to the hospital. Shelley grabbed her bag and raced out the door; she knew it was serious but she had no idea Delano would never walk again. Delano had nearly severed his spine and there was no hope for recovery, he would require a lifetime of around the clock care. Because the VA and other government agencies could not or would not provide him with the care he needed, Shelley was forced into early retirement and began the painful vocation of caring for a suffering loved one. Because of the ever mounting medical bills, the Draine’s were unable to afford home repairs that were essential to Delano’s well-being. One of those repairs was to the homes furnace, and as the winter grew colder, it became critical that the family had a reliable heating system. That’s when The Michael & Son Cares Program stepped in. Not too far from the Draine home, Brandi Boxely nervously sat in her cold living room huddled next to a space heater. She could feel her baby kick and every thrust of her tiny feet was like the tick of a clock; Brandi was just weeks away from delivering her baby and her home had no heat. Prior to her pregnancy, Brandi was involved in a serious car accident that left her temporarily disabled and unable to work. With her extended stay at the local hospital over with, Brandi was excited to return home. As she stepped through her front door, she ran into a wall of heat. 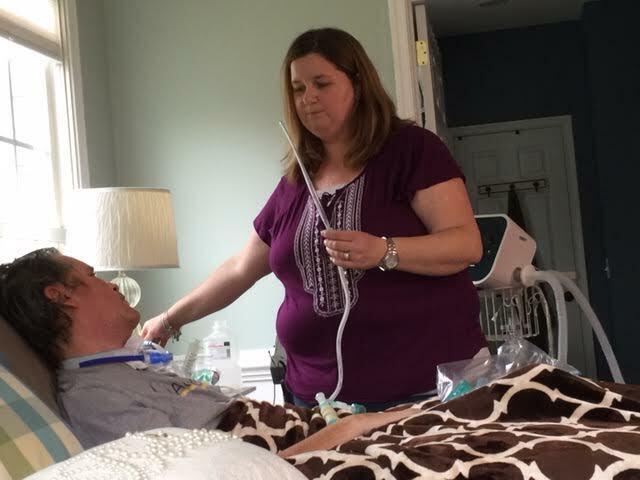 While Brandi was recovering in a hospital bed, her HVAC system was in its death throes. After finding out she was pregnant, Brandi set out on a mission to repair or replace her HVAC system. Being out of work and unable to pay her bills left Brandi deeply in debt. As a result, she was not qualified for financing and none of the HVAC contractors in her area were willing to take payments. One Sunday morning, Brandi happened upon “Helping Hands” on NBC. She took down the number at the end of the show and decided to take one last shot at getting assistance..
Want to find out what happens next? Tune into Helping Hands on NBC, Saturday at 7:00 pm. Also, like us on Facebook, follow us on Twitter and subscribe to our YouTube page to find out about upcoming episodes, special events and much more! The Michael & Son Cares Program, which helps families with home repairs they cannot afford, recently met a very inspirational young man named Alvin King. Alvin was born with no arms or legs and reached out to the Cares Program for assistance with a faulty and dangerous hot water heater. After meeting Alvin King and his mother, The Michael & Son Cares Program repaired the water heater, then went above and beyond to make Alvin and his mother’s life a little bit easier. Since the day he was born Alvin King has struggled with adversity. During his mother’s pregnancy, Alvin‘s mother was given a little known drug for nausea with many unknown consequences which were not expressed by her doctor. One rare side effect of the medication was limb loss during the pregnancy term. As as result, Alvin was born with no arms or legs. Despite the monumental challenges Alvin faces, he always keeps a positive outlook on life and works hard at being as independent as possible. Alvin is able to lift weights, negotiate flights of stairs and even play basketball. One difficulty both Alvin and his mother have been unable to overcome has been transportation. Without a handicapped accessible vehicle, traveling by car is described by Alvin as “painful and dangerous”, causing Alvin to miss physical therapy appointments, family gatherings and most importantly to Alvin, church. After meeting Alvin King for the first time, Proud Son and owner of Michael & Son Services Basim Mansour decided he would purchase a handicapped accessible van for the King family. “I’ve met a lot of truly amazing people in my life but no one quite like Alvin” said Basim Mansour, Proud Son and Owner of Michael and Son Services. “I found the few hours I spent with Alvin and his mother to be so rewarding, I felt compelled to pay him back” continued Mansour. 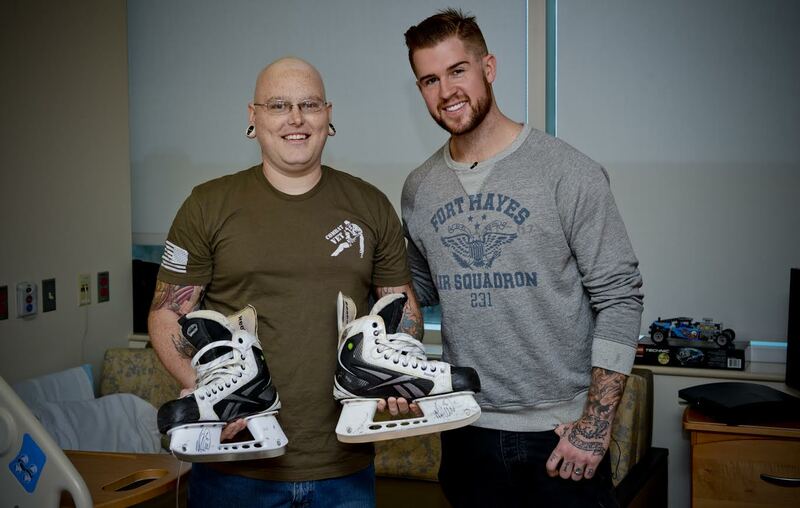 See the full story on the Series Premiere of NBC Helping Hands, returning Saturday, January 21st at 9:30am. Check your local listings for airtimes and also, like us on Facebook, follow us on Twitter and subscribe to our YouTube page to watch full episodes of Helping Hands on demand! 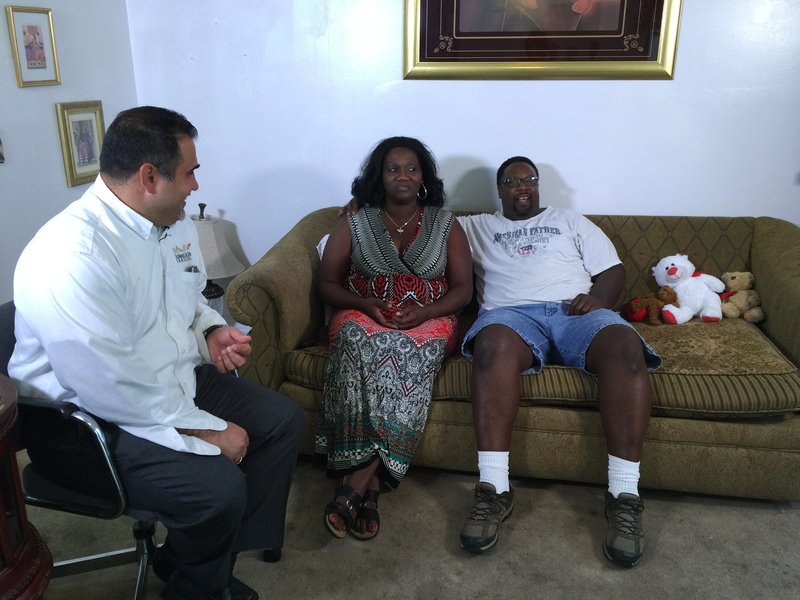 Anthony and Michelle Hinton paced the ER as they waited for an update from the doctor on call. Although nights in the hospital were becoming a regular occurrence, the Hinton family dreaded every second; but no one likes having their child in the hospital, especially for breathing difficulties. The main culprit behind their child’s frequent asthma attacks was a faulty HVAC unit and filthy ducts. While it would seem that the problem would be easily remedied with a simple replacement unit and duct cleaning, for some families it’s just not that simple. Anthony Hinton had proudly served his country for many years in the US Military. Before entering the service, Anthony was an outgoing young man who loved spending time outdoors, family gatherings and live sporting events. However, upon returning from his second tour overseas, something had changed inside him. Anthony began having panic attacks when in wide open spaces or enclosed areas. As time went on, his conditioned worsened and soon he was not able to work. Around the same time, his wife Michelle was diagnosed with severe arthritis and fibromyalgia. With two serious conditions attacking her joints and muscles, Michelle began losing her ability to work full time and before long found herself laid off and unable to work. As the families health problems mounted, so did their bills. Soon, they were only able to meet their most basic obligations and things like home repairs went on the back burner. As their son began to experience more frequent and prolonged asthma attacks, the family took him to see a specialist where they learned poor indoor air quality was triggering the episodes. With that news, the family knew they could not wait any longer and reached out to the Michael & Son Cares Program. Want to find out what happened next? Tune into Helping Hands, Saturday at 7:30pm on NBC4 to see the whole story. Also, Like us on Facebook, follow us on Twitter and subscribe to our Youtube page to find out about upcoming offers, special events and much more! Before Facebook, ALS was widely known as “Lou Gehrig’s Disease” and is a relatively rare disease with approximately 30,000 diagnosed people in the U.S. Amyotrophic Lateral Sclerosis is a progressive degeneration of the nerve and brain cells that communicate with the brain and facilitate movement. As the disease progresses, patients began to lose muscle control and can eventually become totally paralyzed. ALS presents a myriad of issues for the patient and their families. Physical suffering, mental anguish and finical ruin are just some of the ways a disease like ALS can affect a patient and their family. As the disease makes its way through the nervous system, the patient begins to lose mobility and suffer excruciating pain. Day to day life becomes an ever growing challenge and the most basic human function, like taking a single step, becomes a monumental under taking. As the patient takes on these grim milestones, their homes need to be altered along the ADA (Americans with Disability Act) guidelines and that can be very expensive. Everything from bathrooms, stairs, the kitchens, bedrooms and anywhere the patient frequents needs to be made accessible for someone with limited to no mobility. Without help from an outside organization, making a home accessible for someone with disabilities is nearly impossible for most families. Watching a loved one’s physical health literally deteriorate is extraordinarily tolling on the family and can have a dramatic affect on young children. Coupled with finical stresses, the entire family must learn to adapt to significant changes that alter not only the patient’s life but theirs as well. 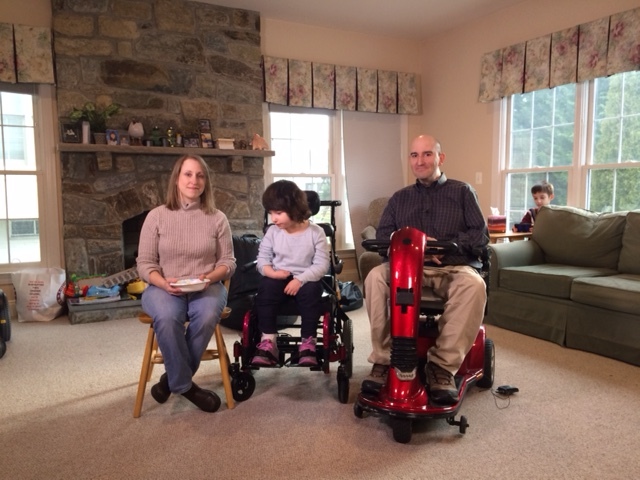 The Murray family is no stranger to the struggles of living with ALS. When Mike Murray received his diagnosis, he and his wife Dena knew their lives dramatically change. They also knew that they would need help. 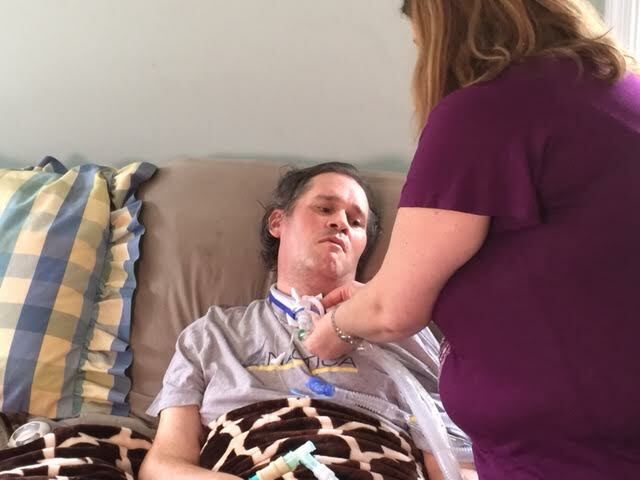 After meeting others families who were living with ALS, the Murray’s learned the true extent of the finical cost they would incur beyond medical bills. 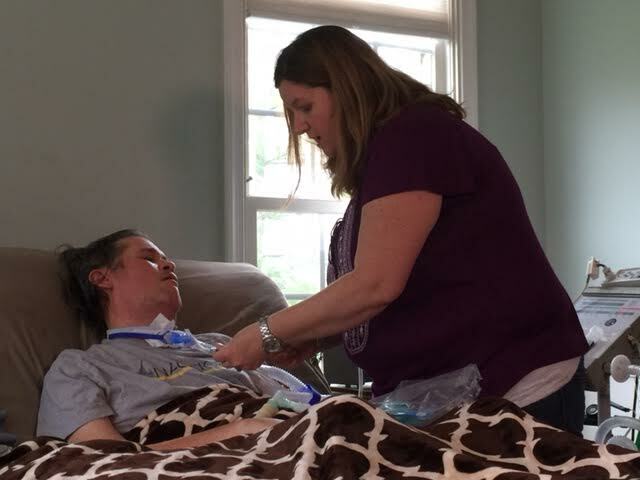 When Michael began to require 24 hour a day oxygen, the family worried about losing during a storms, which frequently occurred in the rural area of Virginia where they live. Then, on an especially stormy night, the family’s worst fear was realized. After a loud crash of thunder, the homes lights went out and a loud alarm rang out from Mike’s monitors. Mike’s oxygen was cut off and he was unable to breath, Dena dashed to call 911 as she prayed he would survive. Because of the distance from their home to the hospital, Mike was taken by helicopter to the emergency room. As Dena watched her home disappear in the distance from the helicopter window, she began to wonder if Mike would come home, and if he did, would he survive the next power outage? Dena began investigating residential backup generators and quickly learned it was something the family would not be able to afford. She began to look for help and reached out to a dozen different not for profit organization and businesses but kept hitting brick walls. 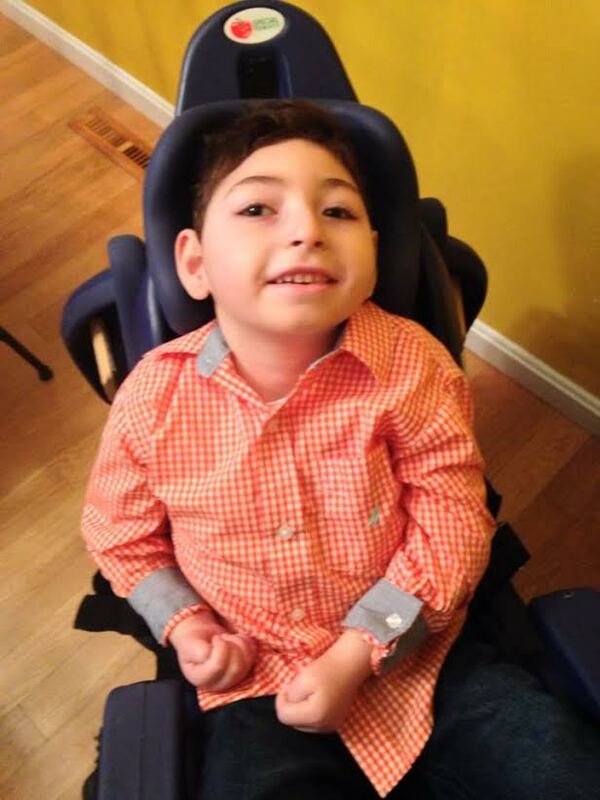 After watching Helping Hands on NBC, Dena reached out to the Michael & Son Cares program. Find out what happened next by tuning into the upcoming season of Helping Hands. Like us on Facebook, follow us on Twitter and subscribe to our YouTube page to find out more information about the upcoming season of Helping Hands. Over the past 5 years, I’ve had the privilege of working with families in our community as the head of the Michael & Son Cares Program. If you have not already heard of us, we are a local home improvement company that helps disadvantaged families with essential home repairs they cannot afford. From restoring heat to cold homes to surprise visits from celebrities; the Michael & Son Cares Program has brought smiles, tears and hope to dozens of recipients in the D.C., M.D., and V.A area. Not unlike Michael & Son Services, The Cares program has grown by leaps and bounds over the past 5 years. One of our proudest achievements regarding the Cares Program is the creation of the Helping Hands T.V. show, which documents the charitable work of the Cares Program. The Cares Program, like Michael & Son Services, has modest beginnings. Today you can hardly drive a mile without seeing a signature blue Michael & Son truck. It was not always that way; in fact it all began with one van and a two man team. In 1968, Mousa “Mike” Mansour came to this country with a vision, to build a family business that his children could one day inherit. An electrician from an early age, Mousa’s natural inclination towards the trade was apparent in his work and he landed a Union Electrician job. On weekends and nights Mousa worked side jobs with his 6 year old son, Basim, tagging along as his pint sized apprentice. It was during those impressionable years of watching his father work that Basim Mansour learned the meaning of hard work, dedication and punctuality. He also learned the importance of giving back to the community that kept him in business. Mousa was not a wealthy man but a generous man nonetheless. He would never leave a family without power on a cold night because they couldn’t afford cost. To him, the smiles on the faces of those families he helped was worth far more than any amount of money. These instances that were witnessed by Basim left an indelible impression on him that would influence the way he would one day run his own business. On June 1st 1990 Mousa “Mike” Mansour suffered a fatal heart attack, leaving his family and community devastated. At the young age of 19, Basim picked up where his father left off and began his own business, Michael & Son Services. Today the company has over 200 employees, offers comprehensive home services and spans four states and our nations capitol. As the business has grown, so has the number of Cares Program recipients. The CaresProgram reaches thousands of people each week through the local TV program “Helping Hands”, however, we hope to inspire more businesses and individuals to give back to their communities in any way they can. If you or someone you know is in need of assistance, please visit michaelandsonhelpinghands.com for more information.